Snickers always wears his collar & tags. He's also microchipped. As one aspect of responsible dog ownership, I believe our canine companions deserve at least one form of identification (tags, microchips, tattoos) in case they are lost. Although tags are the easiest solution for someone to see and read if they find your dog, collars can break or slip off and are not always enough. According to the American Humane Association, only 17% of lost dogs find their way back to their owners. 17%!!!!! Microchips and tattoos are more permanent solutions than ID tags and give your dog a much better chance of being returned to you if they end up in a shelter. 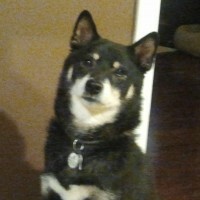 I recently received an email from a Shiba friend suggesting I write about microchips. She said: "I have been involved with several Shibas and 2 Schnauzers that were lost. I took them to a vet to check for a microchip. They all had one. However, when I contacted the number on the microchip it was outdated. … These dogs were all re-homed because no one thought to change the pertinent information." I have had similar experiences working with NYC Shiba Rescue. Most of the dogs we receive are not chipped. We have also received many who were chipped, but the chips weren’t registered. One chip led us back to a pet store. They tried to contact the people who bought the dog from them, but the info they had was out of date. Microchips are more permanent than collars, but what good is a microchip if you never associate any information with it or let that information get out of date? None whatsoever!!! Moving is a hectic chore – so much to do, so little time. However, my guess is that when you have JUST moved to a new area is the time you are most likely to lose your dog. If your dog gets loose accidentally and runs, he won’t know where he is when he stops running and tries to go home. Nothing will smell or sound familiar and there is almost no chance that someone who recognizes him will spot him. Please, please, please… when you get a new puppy, change vets, change phone numbers or move, update the personal information associated with your dog’s microchip. Also order new tags for your dogs collar ASAP. A pet’s microchip is simply an RFID (radio frequency identification) chip. RFID chips are used for all sorts of things: tracking shipping palettes of merchandise, key cards for proximity locks, "tap & go" credit cards, and more. To identify pets and livestock, a passive (non-transmitting) RFID chip is put in glass capsule – about the size of a grain of rice – along with a tiny antenna and injected under the animal’s skin. Since it doesn’t actively transmit, no power supply is needed. A scanner is required to activate the chip, at which time it will briefly transmit its unique identification number via radio waves. This, however, seems to be where people get confused about the value of a microchip. This unique ID number means absolutely nothing on its own. Just because a dog is chipped, it doesn’t mean the vet or shelter that scans your dog will magically know who he or she belongs to. Once the vet or shelter has the number from your pet’s chip, they can tell what type of chip it is and will contact the associated chip registry. The registry will look up the number and either provide the contact info to the caller or will attempt to call you themselves. There are numerous microchip manufacturers, but there are three primary manufacturers of microchips for use in pets in the United States: Avid, HomeAgain, and Trovan. The registry for Avid chips is PETtrac. PETtrac charges a one-time chip registration fee and registration is for the life of your pet. They charge a small fee for information changes. PETtrac only registers Avid chips in their database. PETtrac can be contacted by telephone at 800-336-2843 ext 4. They do not have an online registration option. There are two companies which sell and register Trovan chips. They both register chips from all other manufacturers also. They are InfoPET and AKC Companion Animal Recovery (AKC CAR). InfoPET charges a one time lifetime registration fee. Registrations and changes can be done by phone (952-890-2080 ext 100) or online (InfoPET). AKC CAR also charges a one time registration fee for life. Registrations and changes can be done by phone, fax, mail or on the AKC CAR website. My dogs are microchipped and have lightweight ID collars that they wear 24/7. These collars are separate from their walking collars and have their ID, rabies and other meaningful tags on them. I think a separate ID collar is very important. If your dog pulls against their walking collar and breaks it or pulls out of it, they could be running off and leaving their ID behind. In addition to his rabies tag, city license tag and Delta Society tag, Snick has a stainless steel ID tag with my mobile phone number, the toll free PETtrac phone number and his Avid microchip number engraved on it. Snick’s microchip is Avid and has always been registered with PETtrac. Tonight, I also registered his chip with the HomeAgain registry (which was quick and easy online and only cost $15), since that seems to be the most popular and well-known registry. UPDATE January 2013: Since writing this post, I’ve added Tagg Pet Tracker (GPS units) to my dogs’ collars as an additional way to keep them safe (by hopefully not losing them in the first place if they accidentally get loose). Very good. I agree with this strongly. Absolutely correct… and update that info! Ours has our vet’s info on it currently, but it’s getting changed soon. Where do you find the lightweight collars that the NYCSR shibas wear 24/7? I’ve been searching and searching for something similar, and while all my dogs are chipped (great article!) I’d still like them to wear an ID tag if I can help it! Jens latest blog post..Simon’s Cat! Jen – Originally, it was a special made item for Snickers. Every collar I bought him tore his fur. I started using a martingale for walks and had this ID collar made for him to wear 24/7. No hardware meant no fur pulling or cutting! It worked so great that now the rescue buys them by the dozen and multiple other Shiba peeps have ordered one also. It’s basically a larger version of a cat safety collar. It is made by National Leash. They don’t have it on their website, but if you email Jon and ask for “the Snickers collar” he will know exactly what you want. I’m really appalled that the chip companies are charging people to update their information. I chipped my service dog so she would be returned to me, now i have to pay every time i change addreses, phones or whatever. I’m a full time RVer, and this could concievably get quite expencive. Not to mention I’m on a fixed income. Just when you think they have something to really help people, you find out it’s just another way to rip you off… This should be part of the registration fee, especially when it’s a service animal… Maybe the money is for some CEO’s majic umbrella…..
Ron – I can totally understand how frustrating that would be. Unless someone created a non-profit registry that was supported by donations though, I don’t know how the registries can pay for their systems and employee time without charging for their services. Although… I would pay a little extra for registry services if I knew they used that money to offer free or discounted services to people with service dogs! I’m totally late on this discussion (love the new website, though!). I wanted to comment because our local Las Vegas shelter was recently in the news in a story about overcrowding due to foreclosures, and a shelter employee made the statement that they (the staff) “don’t have time” to scan found animals for microchips. I’ve got all of my cats microchipped, but I don’t have collars on all of them, and apparently, the collars and tags are what could save them from death row if they ever managed to escape from the house. I’d heard anecdotes from pet owners saying that the shelter hadn’t scanned their pet for a chip when it had been picked up by animal control, but this is the first time it’s been stated as policy that the shelter doesn’t scan. Depending on where you live, I think both collars/tags and microchips are necessary. It’s really too bad that we can’t get a uniform policy which would make the microchips more reliable. hi Leigh Ann, thanks for the compliment on the new site! I completely agree that using every means of identification available is the best way to go. You can never be sure what may fail (collar lost? no scanning at shelter?) and which could be the one that reunites you with your pet! Colin – I didn’t realize the Trovan chip (which I did include info on in the post above) wasn’t readable by many scanners. Thank you so much for that information! I agree that is a problem. This is definitely an area where standardization would be useful. Hopefully, one type of chip will win out soon. Great article then, still great article now! !